Last edit: 7 years 4 weeks ago by tom. 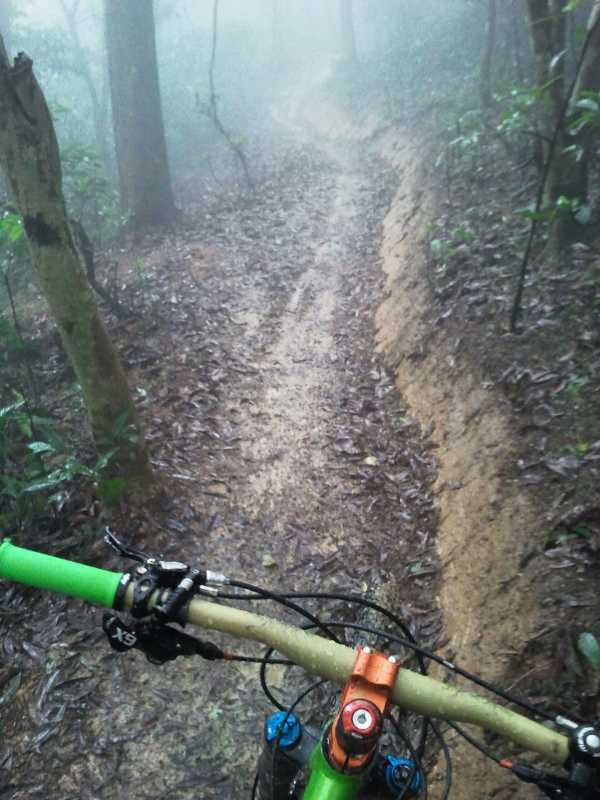 Just rode New Tin Fu Tsai for the 5th session this month and it looks like the trail will hold up even during the rain (like last week) where the clay surface basically turns to mud. I know normally if it's muddy, one should stay off the trails, but made an exception since that's the point of building the trail to these new (for AFCD) standards, to see if the trail can hold up to rigourous use/abuse in Hong Kong's climate! Anyway, also bumped into the AFCD guys (not the office ones, but the ones that do shovelwork)... they confirmed it was them that have removed/changed some trail features since the opening. Apparently because some bits are "unneeded"/excessively narrow as it's meant to be a "one way" trail. I asked them about if work is going to carry on with Tin Man being the next target, and all they had to say was they're just waiting for the nod from "the boss" (the guy with the official AFCD MTB? ). Then the conversation wondered off to the fact the country parks (and residential estates) don't have things like monkey bars, swings, slides, roundabouts, etc because the govt. got sued by daft parents after their precious little munchkins got injured... so the govt. got rid of them all. Thanks very much for the pictures, videos and link to the new map. I don't mind that the new trail is "easy". It flows well and is fast and fun. It's great that it is one way to so you don't have to worry about what's coming towards you like at Tai Lam Chung Reservoir Loop. The Ho Pui renovation is exactly what I'm worried about. The erosion in some parts is quite bad and we should try to get it renovated and hardened properly so that we can enjoy it for many years to come. Made it! Foggy and pouring with rain... oops! The switchbacks at the beginning seems to cut through a natural watercourse, which was holding up quite well by the looks of it what with the stone-cladding/drainage stuff put into specific places allowing the water to run "underneath" the trail surface and points to the "New Improved AFCD" way of doing things, where as previously, it'd probably have meant slapping down some nice shiny grey concrete. Yummy! I had also noticed the step-up towards the end (or small drop-off if going the wrong way), appears to have gone. Considering it was some quite chunky stone and wasn't apparent it was even missing first run down Sunday just gone... I guess the AFCD removed it rather than a bunch of bikers a few days after the inital opening? 20~30 second mark for what would have been a stream in the heavy rain. 5:10-ish for the step-up which seems to have gone! As for "don't fix anything"... it's too shortsighted a view. Yes Ho Pui is awesome "rough and ready" (I rode out that way on the opening Sunday), however water erosion will gradually take its toll on the downhill section for example. If the surface isn't stablised, it will just get worse until at some point, the AFCD will just have to close the trail (to everyone) whether we like it or not. Fixing a trail so that it doesn't "rot" and fall apart over time (and in previous cases where "Old AFCD" remedial work was to concrete over everything (hmmm, steps! ), actually makes things worse by "concentrating" the water forces either side) need not be the same as "dumbing it down". You can clearly see the NTWRLUN™... which admittedly does look very lonely out there on its own. Curiously though, and if anything my main gripe with the so-called MTB trail sections around Tai Lam, is the existing paved access road is also "counted" as trail (and in this case, you're meant to ride up with, and doing downwards only for NTWRLUN™). Then for new trails... 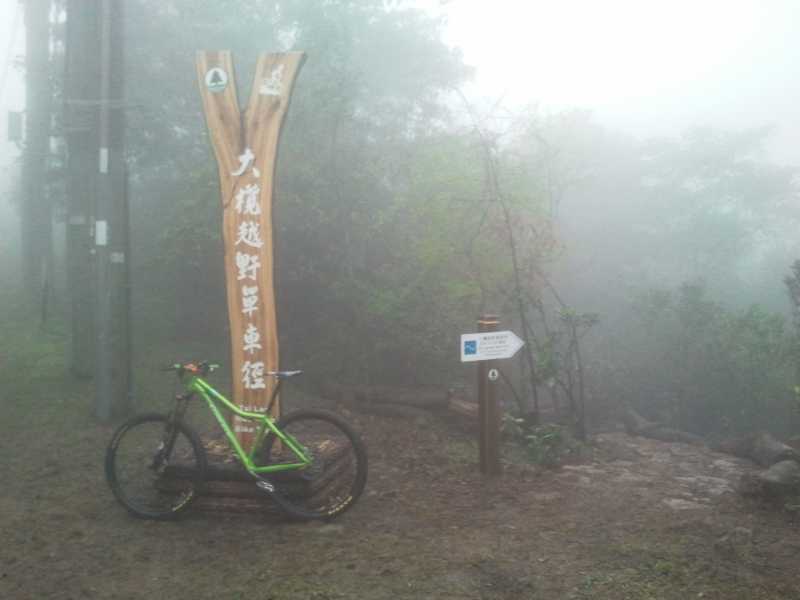 I'll link again to the HKMBA Mountain Bike Strategy Plan , which inside details new trails within Tai Mo Shan CP, where currently there isn't actually even any dirt trail. It's just the concrete access road to the summit and "out of bounds" for anything on two wheels (without a combustion engine). As per the study, there's a whole load of potential there for some awesome world class trails. Admittedly, not sure how to tackle Route Twisk, as to either have any future TMS trail link up to the Tai Lam stuff, you need to cross Twisk. Likewise, to stay within the CP area and end up in Shek Kong village/Kap Lung, you have to traverse Twisk again (otherwise you'll end up in Kadoorie farm!). Hum....don't fix Ho Pui......it is fine as it is rough and ready!! I hope they can do the real Tin Man next. It is the longest descent in HK. As for the Hornet, AFCD had torned down the jumps but nonetheless, it is a great ride. Well I didn't help out with the digging and I am not really a down hill person. But one thing I know, some downhill folks do dig trails but they are not working with the AFCD. On that particular Sunday, one of these trail digging downhill folks actually was diging and he had just finished work when we arrived at the bus stop. He wouldn't tell us where it is yet. Downhillers and AFCD are mortal enemies. They built trails but they like to do it illegally or in land not governed by AFCD (like Tin Ping Shan). By doing the Tin Fu trail, it is a great chance for MTBer and AFCD to get know each other in a legitimate fashion. But keeping in mind, there will be mountain rebels who will ride anything that is ridable whether it is legal or not. And in ways this is a card that can be used for legit organization to push forwad in opening up more trials since illegal riding is a sign that new trails are badly needed. Anyway, what I want to say is, any riders doing any kind of riding in the mountain helps move this sport forward. Well excepts if you crash into a hiker, that will be a horrible set back. Rode it on Saturday with bikesteve and some of my mates. First time riding in the area. It was very muddy, but still very good fun. I thought it flowed very well, just like the singletrack you see in some of the better MTB videos/photos out there. Definitely different from the "good" part of the Tai Lam Chung reservoir loop, which we rode in the afternoon, and which is definitely more of a mixed hiking/biking trail, as well as Shek O. 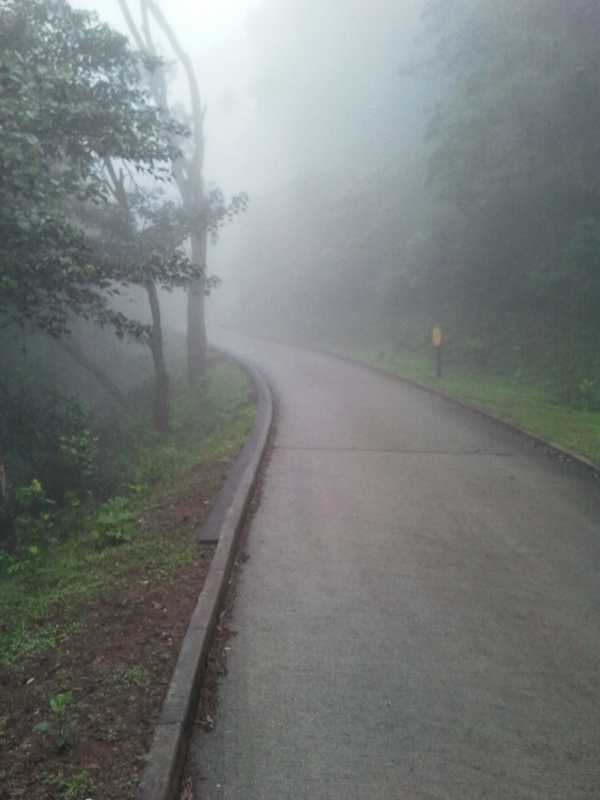 The only criticisms I have have been set out above, namely: (1) It's not the most accessible trail particularly to less-fit riders (2) It is a bit short (3) The relatively steep climb up the road to the start is also off-putting, which is made worse by the other 2 criticisms! However, the positives definitely outweigh the negatives, it being a fun trail which can be ridden after warming up on the beginner tracks near Route Twisk. It is also very good as a "Starter for 10" (perhaps more, even) in developing the relationship between MTBers and the AFCD. Thumbs up. @Ratcat: I was also initally a bit confused about the point of Tin Man- it's such an easy trail that it was a little disappointing to be building something that would be comfortable on a fully rigid bike. But after a couple of days of trailbuilding, and talking to the HKMBA guys, the IMBA and even the AFCD I'm now pretty much with Tom on this one. After years of mountain bikers having a completely adversarial relationship with the AFCD, it was great to spend time working with some of them building trails. Some of them at least are really decent people and hopefully the relationship continues to improve. What I was personally disappointed in was the turnout from mountain bikers. There are easily hundreds of regular riders on TMS on the weekend, dressed in the latest fashionable gear, sporting Leatt braces and 30+K DH bikes, and a lot of them knew that there had been a request for volunteers to work on a new trail. Yet the vast majority of them didn't care enough to give up a day of riding for a day of trailwork, all the while saying "yeah, I heard about that trail and we'll check it out once it's been built" (this is a real quote). The vast majority of volunteers I met were not TMS 'downhillers'. They usually rode in other areas, they were new to Hong Kong, or they were even new to mountain biking. I even met a group of road bikers who were willing to help build the trail. Generally, a lot of them were exactly the kind of riders that'd be happy to slog it out there on the concrete road and then do a bit of easy singletrack. Seriously- to the TMS downhillers: WTF kind of attitude is that? Are the regular TMS bikers really so apathetic or so happy riding the same small number of erroded trails over and over again that they can't wield a shovel for a day? Last edit: 7 years 1 month ago by Jeff. All very good points raised. I would love to see Ho Pui renovated as it is a good, fun trail and very few hikers so lots of good potential here. Where is this Hornet trail that you guys mention? In terms of a competition venue, there is a push to get the Tsueng Kwan O landfill into a XC competition event. tom wrote: What HK really needs a closed off MTB competition venue which could combine XC, DH and Freeride . Unfortunately this will never be realized within any CP because its impossible to legally exclude hikers and other trail users from these kinds of trails if they were ever built. As far as I see it, any trail that is rideable, it should also be hike-a-bikeable. Having foot access means it is open to hikers and runners. As and when there are competitions, close sections/divert paths as required. Hong Kong does this on the roads pretty much every other week be it for fireworks, horse racing, larger trade shows, Standard Chartered marathon, 1st July protests, etc, etc, etc. The problem with a dedicated MTB trail centre (of LCSD jurisdiction rather than AFCD, say)... which would sit idle most of the time. Leave these big white elephants to the velodrome cyclists!